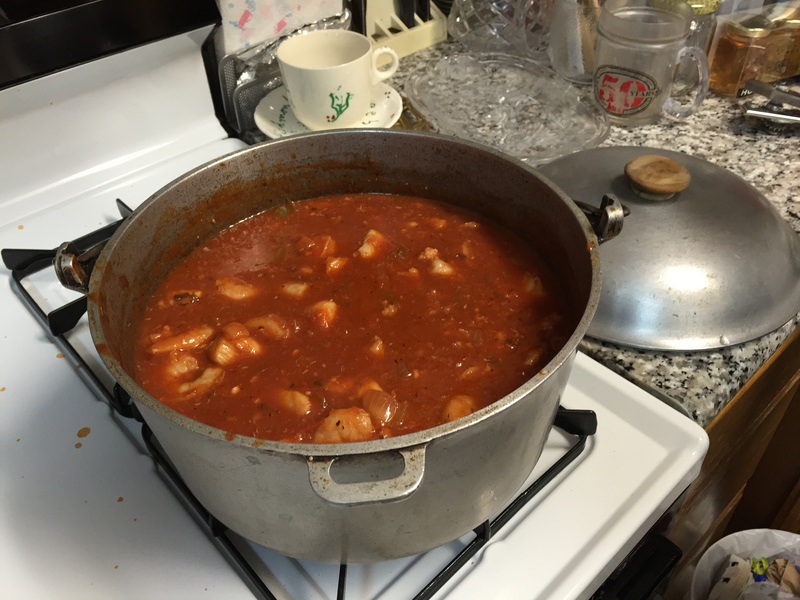 Cioppino is an Italian fish stew that an excellent choice for a cold winter’s day. (Even in LA). Temperature today in San Pedro is in low 50’s with light rain. Not exactly weather back in Mass, but chilly nevertheless. The attached recipe belonged to Paula’s father Harold. Harold died in 2009. Whenever we have it, we think of him. It was one of his favorite dishes. 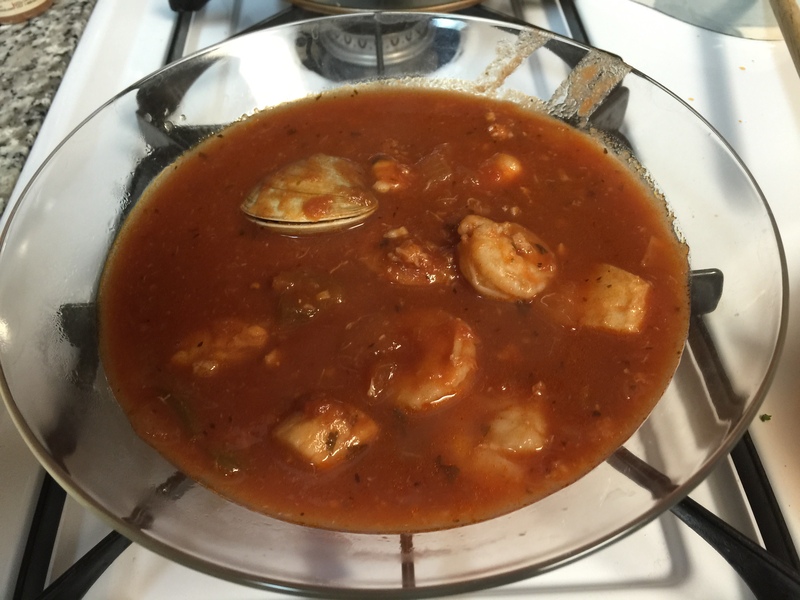 There are tons of recipes for cioppino available online. Here is the pointer to the Wikipedia entry. Selection of fish depends on what’s available at fish monger. Quantity depends on how many people you are serving. Our choices also depend on the price of various fish components. One can end up spending a lot of money at the fish counter. Heat oil in large kettle. Saute onion, garlic, parsley, celery and green pepper until golden. Add tomatoes, tomato paste, salt, paprika and wine. Simmer 15-20 minutes – Stir occasionally. Add water and remaining seasonings. Cook slowly for 45-60 minutes. 15 minutes before serving. Add chunks of white fish. 10 minutes before serving. Add shell fish. Cook over low heat until fish are done. The clams should open up when they are done. Serve with garlic bread and a glass of red wine (in a glass, not the soup). I suggested Chianti, but I was outvoted by Paula. So we had a nice Cabernet Sauvignon). Thr version we made tonight didn’t have either the crab legs or lobster tails. Too expensive. Last night Paula and I decided to go to the movies. We saw the movie “Wild” starring Reese Witherspoon and Laura Dern. Directed by Jean-Marc Valee. The story is about the true story of Cheryl Strayed who went on an 1100 mile trek on the Pacific Crest Trail from the Mojave Desert to the State of Washington. So the story is of Cheryl making an impulsive decision to hike the Pacific Crest Trail after the death of her mother and the failure of her marriage. We keep seeing flashbacks of her final days mother’s death from cancer. We get the feeling that Cheryl is woefully unprepared for the journey that she has begun, On one of the first nights on the trail she has trouble figuring out how to set up her tent and use her backpack stove. Her pack is way overweight with stuff she really won’t need. The story of is one of challenges and her learning how to depend on her self. The movie ends at “The Bridge of the Gods” over the Columbia River in Oregon. This is not actually the northern terminus of the trail. That is actually in British Columbia in Canada. 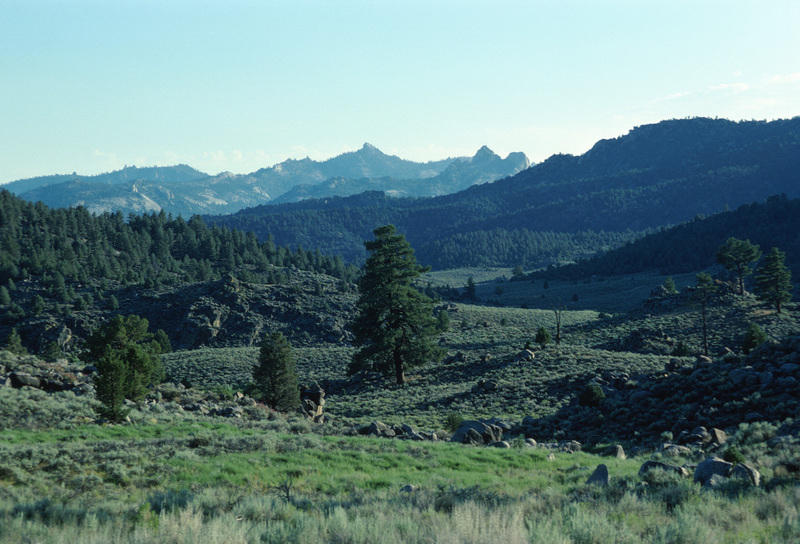 Another waypoint featured in the film was Kennedy Meadows in Tulare County, Callifornia. Population 28. Some really beautiful views. We both enjoyed the movie. I’d give it about 2.5 stars out of 4. The flashbacks are a bit disjointed. I was never quite sure about how the flashbacks connected to the main story. There’s a lot of beautiful cinematography. Oscar material? Not sure, maybe for cinematography. I don’t see it for best film or best actress. Tomorrow, we do Christmas Cookies. Stay tuned. Well, here we are the day before the day before Christmas trying to finish up shopping and wrapping presents. So a couple of days ago, Mary told us that she was feeling down about Christmas. So what was the problem, we asked. This is what she told us. In years past Harold and Mary would travel out toward Palm Springs. 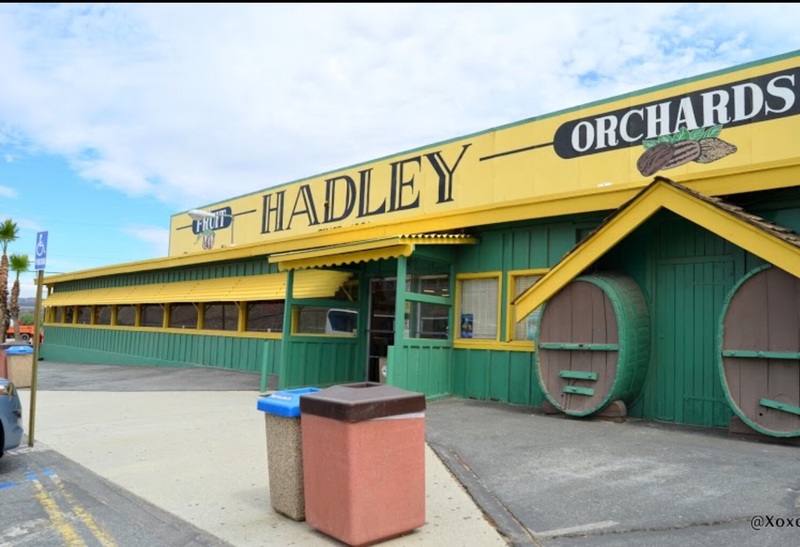 They would stop at the Hadley Orchards Outlet and order gift baskets to be shipped to relatives and friends. We would often receive a two pound box of dates. It didn’t matter that I didn’t particularly care for dates. So for the last few years after Harold died, she didn’t get to do this. So we suggested that we could order online from the Hadley web site. We told Mary that this would be an all day affair. It would take at least 2.5 to 3 hours each way. Mary doesn’t understand buying stuff on the internet. So on Monday, we were about to bite the bullet and take her out to Hadley and get it done. Can you tell me who you want to send packages to? I ask. She says she will have to look at her address book to make a list. So she can’t remember the names. I sort of know who she is thinking about sending to. But I can’t quite get her to tell me. Just give me the names, I say. I can get the addresses. So I am thinking that maybe, I need to keep a log book to document each decision and have her sign off on it. Nah, that won’t work. So my point is (I do have a point). How do I get her decisions documented so that when she changes her mind and deny that she ever said something. By the way, last night was “date night”. We went to see “Wild”. More in the next post. And tomorrow, we will be taking care of Jonathan. We’ll be making Christmas Cookies. Should be fun. 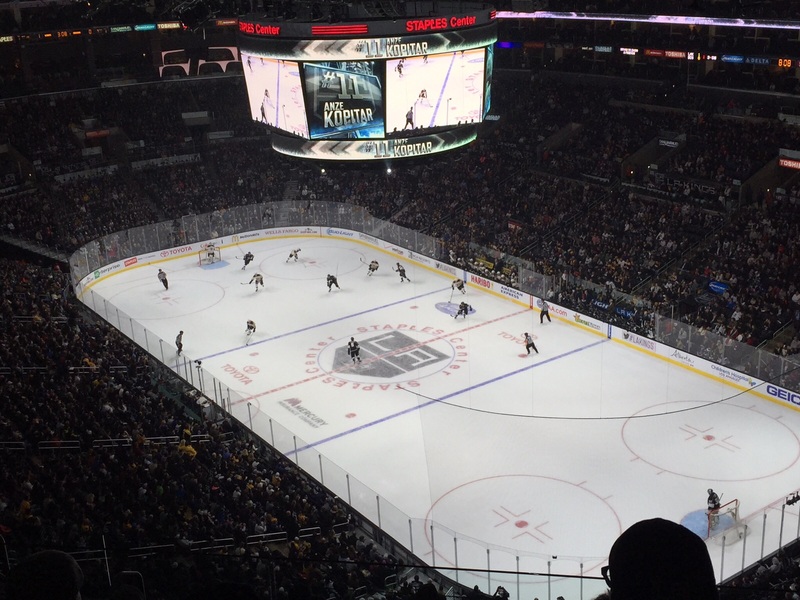 Last night Paula and I attended a hockey game between the LA Kings and Boston Bruins at the Staples Center in downtown LA. We got the tickets as part of an alumni get together event from Northeastern University. The event included a pregame get together in a conference room with other NU Alumni. We had a nice buffet dinner and snacks. Non-Alcoholic drinks were free. There was a cash bar with way over priced drinks ($6 for beer and $12 for mixed drink. We were greeted by Bill Woodman Director of the NU Fund. The Bruins seemed to not have any offense to speak of. They kept the game close but couldn’t get anything past the Kings’ Goalie. The score was 1-0 throughout most of the game. Kings added an empty netter late in the third period. What amused me was the amount of entertainment during timeouts and between periods. Halfway through each period a swarm of scantily clad lady ice crew skated out to fix up the ice. I should have brought my binoculars. You can buy a calendar with pictures of the LA Kings Ice Crew. Such a deal. Then there was the “Dance Cam”. A camera would spot light many fans up on the jumbotron while they showed all of their moves. Then there was one sad looking guy wearing a Bruins cap shown on the jumbotron who was loudly booed by the partisan crowd. They also had a gimmick where a fan could win a ride on the Zamboni between periods. Not only were the seats a long way from the action, but they were small and lacked any leg room. My right knee (the one where I had knee replacement surgery a few years ago.) was in constant pain from lack of room to stretch out. Luckily Paula had some ibuprofen for me. We had a fun time. Though I really hate driving into downtown LA at rush hour. My thanks to Bill and the rest of the Alumni Office back in Boston for making sure that we all received our tickets and had a good time. Here’s the pointer to the Facebook Page for NU Alumni. I’m looking forward to baseball season for an Angels-Red Sox game.